I am finally awake, stable, and coherent all at the same time! It is now 12:48 a.m. Such is life. On a good note, I was able to march around outside this evening in my snowshoes for about 30 minutes this evening. The night air felt bitterly cold yet the sky was clear with all of the stars visible in our Midwestern corner of the world. 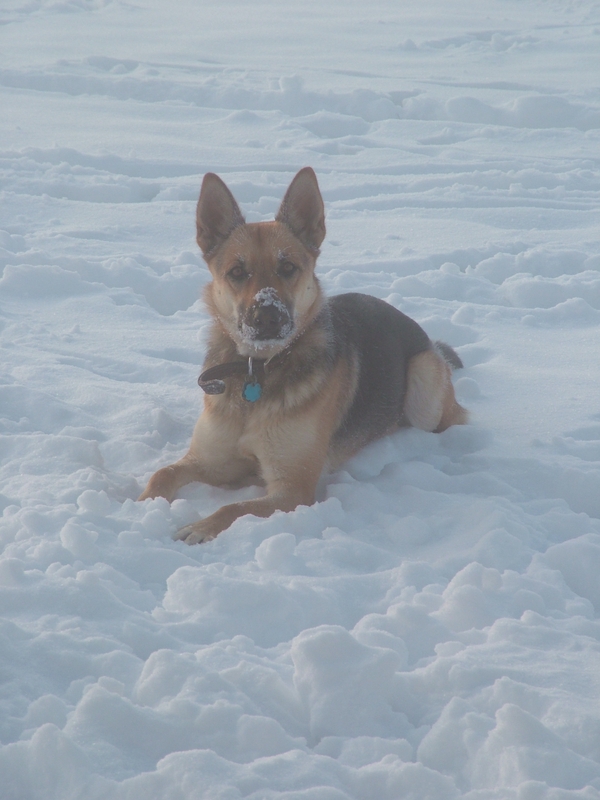 I love seeing our German Shepherd, Elle, jump from one snow drift to the other as she chases after my husband and me. But perhaps my most favorite moment was seeing her waiting for me as she looked into the house from outside on our covered porch. Steve had taken off cross country skiing in the backyard and pond area. 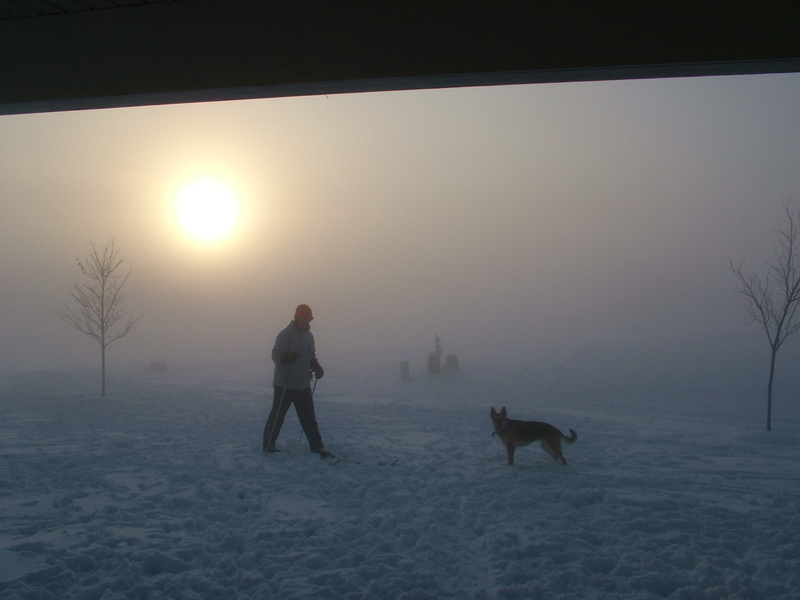 She usually follows him closely, often pouncing behind him in his tracks when the snow is deep. Today she knew that I would be headed out with him shortly after he left and there she was: waiting with her big expectant brown eyes. Ah the love of one’s pup! Sometimes when I am alone it is hard to feel the love that I know exists in my life. When I am the sickest each morning this is especially true. For me it seems that so much of the success of recovering from this time of illness will lie in what I do with the grief of the trauma I have experienced. For over two years now, I have felt traumatized by the wretched seizure attack episodes that wrench my body with pain, headaches, cognitive changes, ringing in my ears, crying, spontaneous vocalizations, and violent seizing. For over two months, the episodes last around four hours total per day with the worst ones occurring in the evening. The sadness can be overwhelming; the disappointment each time they return can be heavily discouraging. Both can lead to a sense of emptiness that is devoid of love, hope, and meaning. At some point I recover enough from an attack to get something to eat or drink. Even eye contact with the lone pet left behind with me when everyone else in my life has gone off to work or some other noble activity can be a mixed blessing: comforting and protective (yes) yet a pittance for more meaningful human contact. By the way, where is God? Yes, I often long for Jesus with skin on at these times. I am grateful that most recently I have found Him in the caring voice of a friend on the phone and always in the loving embrace of my beloved Steve. Sometimes I miss picking up the phone and calling my mom. This desire to connect with her seems stronger the more the years go by since she passed away nearly seven years ago. I guess it is normal when a person goes through a time of testing or sorrow to desire the comfort and wisdom of a parent no matter what your current age might be. If my mom were still alive today I think she would want me to keep moving, keep going, keep trying despite the setbacks. O.K. mom: will do. For tonight I’m going to call on the One who sees me whether or not my husband is around, the dog is awake, a friend is home to answer the phone, or my self-soothing words in my heart to my deceased mother means anything. I’m going to the throne of grace. Yes, thank you Matthew Henry. I will hold onto the psalmist’s words of comfort inspired by my Lord who sees me on my bed of sickness, who promises He will never leave me or forsake me. And if it be His will, He will deliver me from my suffering. Into this night and for the rest of my nights I will ultimately rest in the loving arms of the one who is showing me His goodness despite the darkness. No matter what the next day might bring I will trust You. No matter what the next hour may bring I will wait on You. Previous I’m stuck to my chair!